In the past, every country with a space program jealously guarded its technological secrets. Today, however, collaboration is the name of the game. Will the trend toward joint projects increase in the coming years or will a new space race emerge? Roscosmos chief Vladimir Popovkin and his European Space Agency (ESA) counterpart, Jean-Jacques Dordain, have recently signed a partnership agreement on the ExoMars interplanetary mission project. 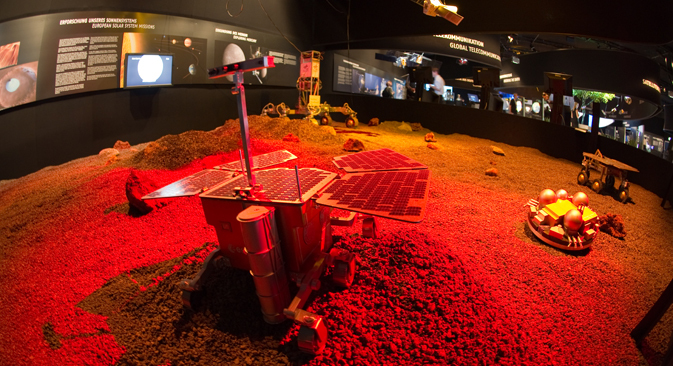 ExoMars envisions two joint, Russian-European missions to Mars – one in 2016 and another in 2018. “The partners have agreed upon a balanced sharing of responsibilities for the different mission elements,” the ESA reports. Russia will be responsible for the launches, as both will use Russian carrier rockets. In 2016, an atmospheric gas analyzer will be sent to the red planet and, two years later, a rover will be delivered to Mars. “This confirms, once again, that projects of such a tremendous scale have to be implemented through international cooperation. The scientific data we will obtain during all the planned missions are important for the worldwide community,” Popovkin said during the signing ceremony. European scientists had planned to launch ExoMars seven years ago, but the project has been postponed several times. Some believe Russia saved the project. “ExoMars faced a big challenge when NASA withdrew from the project, but the Europeans invited Roscosmos to participate and the project became operational,” says Dmitry Baranov, senior expert at Finam Management. Despite financing difficulties, the ESA has an even more ambitious space project in mind than Mars: the agency’s top priority is Jupiter. In 2022, Europe plans to launch a robotic probe to the planet. The JUICE mission (Jupiter Icy Moons Explorer) is the ESA’s most expensive project to date, involving 500 scientists from 17 countries. Russian specialists will be engaged in the exploration of Jupiter, too: Roscosmos is planning to create a space vehicle to land on Ganymede (one of Jupiter’s moons) and work together with the European satellites. American and Japanese specialists are engaged in the project, alongside Europeans and Russians. Experts appreciate the cooperation of increasing numbers of countries in space projects. “The main benefit of international cooperation is that the leading nations have reached an understanding that large projects should be implemented in cooperation, not only because of high costs but also because such projects can attract the best minds for developing and implementing such programs,” says Baranov. Besides missions to distant planets, international teams of scientists are working on telescopes and observatories to replace the Hubble Space Telescope, whose operating life will end in 2014. Among the possible successors is the World Space Observatory-Ultraviolet, which is planned to launch into a 21-mile orbit in 2016. Ground control and data-processing centers are expected to be established in Russia and Spain. “The station is expected to be fully operational for at least five years, but it may work longer. There are examples of American stations that have been in operation for 19 years instead of the planned five,” says a source at the Astronomy Institute of the Russian Academy of Sciences. According to Roscosmos estimates, Russian producers of rocket- and space-engineering account for 10 percent of the world market, but their share is expected to increase to 16 percent by 2020. Not to lag behind in space, Russian authorities are injecting big money into the space program. The adopted space exploration program for 2013-2020 is set to cost an estimated $60 billion. Many countries are following suit and boosting finance for their space enterprises, so experts do not expect changes in the rankings of the space powers in the next few years. “Russia is the acknowledged leader in global astronautics in terms of the number of launches, and it is unlikely that it will lose its leadership. When it comes to global rankings, not only Russia but also the U.S., France, the EU and Japan will likely remain leaders, with no major challengers. “Nevertheless, new space powers – including China, Brazil, Iran, etc. – will continue developing their space industries. However, there is still a long way for them to go to catch up with the leaders, so the ‘correlation of forces’ in the sector will remain virtually unchanged in the years to come,” says Baranov.